For the final phase of this project, I am planning to turn the form of my shoe into the form of a hippopotamus. The eyelets at the top of the shoe will be made into the big eyes, ears will be added on top of or around the strap, and nostrils will be added to the toe of the shoe. I’d like to use blue/grey and deep purple fabrics for the top of the shoe. For this, I’d like to use wool or fleece. I don’t know the cost of wool or fleece and I don’t have experience using it, so it may be better to use regular fabric. I’d also like to use a harder material (perhaps wood) for the heel of the shoe. This harder material will be carved or formed into four legs. I plan to use Velcro to connect the strap to the shoe, and Velcro or buttons to open and close the opening at the top of the shoe where the foot would go. 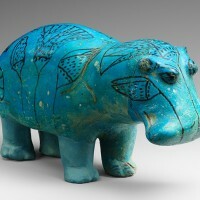 Closing this space would create the rounded shape of the hippo’s back, making the entire piece easier to recognize as a hippo. In the United States, hippos are known for their cuteness. There are plush hippo toys, the game “Hungry, Hungry, Hippos,” and a hippo character in Pixar’s Madagascar: all products made for children. Hippopotamus mothers have a reputation for protecting and caring for their young. Hippos live in groups but the only social bonds formed are those between mothers and their young. In ancient Egypt, the goddess Tarweret, protector of children and pregnant women, was often depicted with the head of a hippopotamus. Part of the reason that hippos are known for being one of the most aggressive animals in sub-Saharan Africa, is because of the viciousness of females who feel their young are in danger. 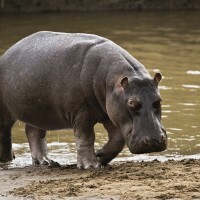 Hippos have been known to attack crocodiles, hyenas, and even lions. Zulu warriors in South Africa considered the hippo to be braver than the lion. 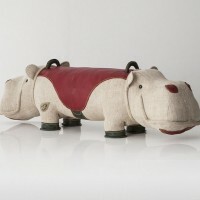 My reworking of the shoe, into something that resembles a stuffed animal or some kind of toy, echoes a hippo’s care for its young by relating a way that a parent might display their affection for a child in this country.